The treatment of neuropathic pain involves a different step-wise approach. It is classically associated with sensory changes to the skin, either numbness or hypersensitivity (this may include allodynia - sensation of pain from light touch). There may also be visible autonomic changes (e.g. altered colouring or temperature of skin, sweating) or signs of motor damage (e.g. muscle wasting). Neuropathic pain may be caused by damage to central, peripheral or autonomic nerves. Adjuvants can be continued through the pain ladder. Examples are capsaicin cream and local anaesthetic gels. 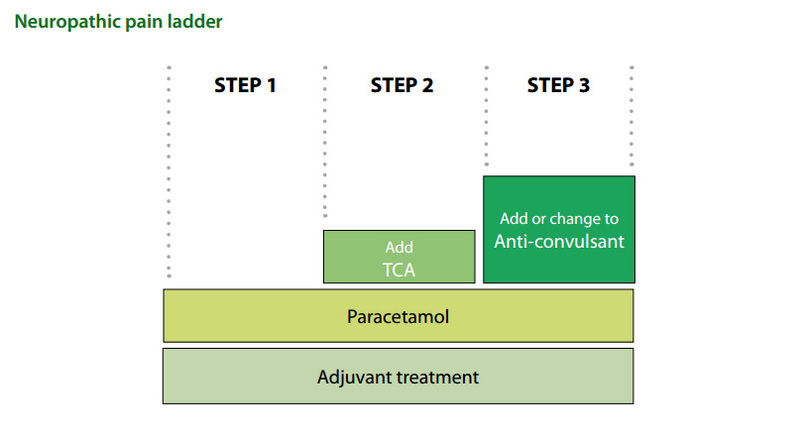 Regular use of paracetamol is introduced first and is recommended at every step of the pain ladder. Tricyclic antidepressants (TCAs) are usually prescribed at night as their sedative effects may assist sleep. Nortriptyline may be preferable due to its fewer adverse effects, particularly in elderly people. Initial doses of TCAs are usually low, however doses can be increased to antidepressant level, if tolerated. TCA dosing e.g. nortriptyline: titrate up from 10mg daily until pain settles. Prescribe nortriptyline 10mg tablets. Increase the dose as directed. Supply 70 tablets. Patient information: The dose may be increased as follows until the pain settles - Take one tablet (10mg) at night for seven nights, then take two tablets (20mg) at night for seven nights, then take three tablets (30mg) at night for seven nights etc. You do not have to increase the dose any further once the pain has settled. For example, if the pain is controlled by taking two tablets at night, do not increase the dose any further. Maintenance doses range from 10mg per night to antidepressant levels (75mg per night). Carbamazepine, sodium valproate and gabapentin are all effective in treating neuropathic pain. Traditionally carbamazepine is the first choice but it must be titrated very slowly to avoid side effects such as nausea, vomiting and dizziness. Complete blood count and electrolytes should be monitored when high doses are given. Carbamazepine dosing: titrate up from 100mg daily until pain settles. Prescribe carbamazepine 100mg tablets. Increase the dose as directed. Supply 70 tablets. Patient information: Tell your doctor if you are taking other medications. The dose may be increased as follows until the pain settles - take one tablet at night for seven nights, then take one tablet twice a day for seven days, then take one tablet three times a day for seven days, then take two tablets twice a day for seven days, then take two tablets three times a day. Do not increase the dose any further once the pain has settled. For example, if the pain is controlled by taking one tablet twice a day stay at this dose. Maintenance doses range from 100mg to 800mg per day and rarely up to 1.6g per day. For correspondence regarding carbamazepine and nortriptyline, see "Correspondence: Neuropathic pain", BPJ 18 (December, 2008). Gabapentin is available funded, on Special Authority for patients who have tried and failed or who have been unable to tolerate treatment with a TCA, and a subsidised anticonvulsant agent. Gabapentin is effective in several types of neuropathic pain. It is generally well tolerated and has few drug interactions. Elderly patients may require titration from 100mg per day. Gabapentin dosing: initial titration from 300 to 900mg per day. Prescribe gabapentin 100mg capsules. Increase dose as directed. Supply 36 capsules. Patient information: Take one capsule three times a day for three days, then take two capsules three times a day for three days, then take three capsules three times a day. Do not increase the dose any further once the pain has settled. Maximum dose is 3.6g daily. If pain control is not achieved at this stage, referral to a specialist or a pain clinic is recommended. Opioids can have a place in the control of neuropathic pain but specialist advice is recommended. There is some evidence that oxycodone and methadone may be the most useful. Titrate the dose of TCA or anticonvulsant upwards until pain settles or adverse effects limits further dose increases. After starting treatment for pain always follow up to assess response to treatment and make the necessary adjustments.